I lean toward fake. The timing (right near April 1st) is a hoax or a major coincidence. 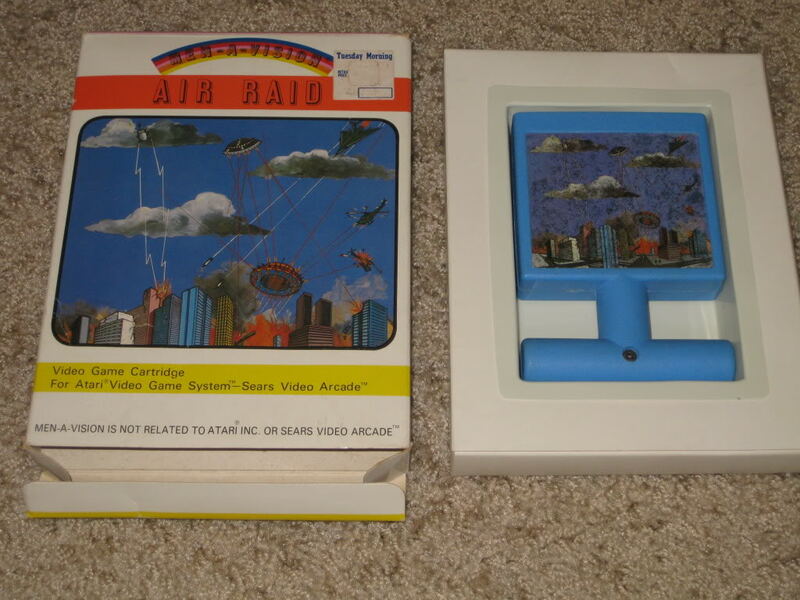 Also, every collector knows Men-A-Vision supposedly made only one game, Air Raid. Right on the box it says "Debut" game by Men-A-Vision. That screams overt to me, like an over-done hoax. I hope I'm wrong, I really do. Ehh, I don't know. I know what it's like to have a rare game and have people call it a fake just because details are so sketchy, so i definitely don't want to call it a foul. If it IS fake, it's a pretty good hoax. It does seem kind of fishy how someone says "hey look what I found! Now it's on Ebay!" Yeah it's fishy all right, especially with April Fool's tomorrow. But yeah, good job if it's fake, with some minor wear on the box and the faded price tag and all. Please check this out guys! I feel it's a fake. But not an April Fool's fake, but a reproduction of sorts. Honestly, with how the economy is now, anything is possible, even someone creating their own box and passing it off as authentic. I really wish I were rich, I so need that game. Wow, it sold for $31,600! Must be real after all! Wonder007, the cart's winner, has a loose Air Raid up for sale. I offered him my two sealed Adventurevision games for the cart. You think that's about fair? If he didn't take you up on the offer, it's because he's just looking for some easy cash to cover his 35K piece of cardboard. If I had a loose Air Raid and someone offered me two Sealed AV games for it, I would jump on it in a heartbeat. He declined my offer, saying he primarily collects for the Atari 2600. The AV games I have sealed are Super Cobra and Space Force. You can see pics here. It's getting stranger. A user by the name of " Stick" is claiming his father made the moldings to the game. Here are his posts, from Atari Age. My father owned a injection molding company in the 70's-90's we were watching the news today and he started laughing He designed the mold and ran 51 parts shipped them out and never reserved payment. it was a test order for a company in Arkansas. He thinks he still has the molds. My father is retired and 74 yrs old. He is the type of man that saves everything, and forgets nothing. I have seen a few other old molds laying it the barn and they weigh a ton, so this should be fun on my back. We will be digging them out tomorrow. Ok the Name of the Company was Norwood Welding, tool, and die Located at 5312 Carthage Ave. Norwood Oh 45212 My Father Jay Moore was Contracted By Charles Rigdon of Felicity Plastics to create a Die/Mold. My father created, cast, made this mold. When Making a Mold it has to be tested. 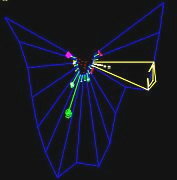 Dad said that 51 parts would really only be 25 and 1/2 games/carts. The one mold would run both sides of the cart. This test run is sent to the client and the mold is then sent to the injection molding people whom then make the carts. The reason why my father was never paid was not the game peoples fault but was the injection peoples. They told him that the parts were to big and the mold was returned. My fathers says his specs were never a small bit off. But the Client stated he made the cast for the part to large by about an inch. The 51 parts were not returned. I asked dad why the extra 1/2 and he said that there is always 1 extra for quality control. The parts were shipped to Arkansas to a P.O.Box with no name. I found this odd and after reading how skeptic everyone is I asked why would you send these parts to nobody. Dad said that Felicity plastics was where his paycheck came from not whomever else. Thats all the info I got, but I can tell you this. I remember my father coming in from work and scrapping potatoes into towels then putting them on his eyes to help with flash burns, he has a hard time seeing now. I was two young to remember much to any of this. I was born in 89 and I am only 20 now, I'll never tell him I said this but I believe my father messed up the order. You just have to know dad.... The jack of all trades master of none type of guy. Hope this has been helpful. I have been fighting the T-Storms and Weedeating all day to beable to even get into the Barn. Deforestification is one of my favorite pass times. I haven't seen anything yet and I really have no clue what it is I am looking for. After talking to dad and the fact that the cart brought 31 thousand I will admit I smell money so i am trying. Also to answer a few questions the parts were shipped to a P.O. Box 1987 Corinth AR 72824. Dad found a old carbon copy log book. Cininoti sent me a PM and I am going to see about having him meet me in the Clermont county area I think that will be have way. Also the mold only cost $4500.00 not $45000.00, hummm trying to remember conversations.... Cart being to long from insert to top of handle...... My father said He had the blue material in the injector from running a test run of baby formula lids so I used it up. One more thing I still have yet to figure out how this is going to pay off for me just yet. If I do find this thing Dad could make more carts only if he could find the right mix of plastics to get the color and texture right, Which isn't easy and to sell the mold well shipping would be ungoodly expensive. I am reading this and playing telephone for dad. The Blue was used for many things Sunoco gas stations used the color, but different texture and heat to make the plastic covers on the gas pump handles. You are welcome guys I was a gamer about a yr ago now I pay 50 bucks a yr to watch netflix. American pickers is the best way I can discribe the way this barn looks wild rose bushes hurt. Yes Greg they are very large... Also does anyone know how to research that PO box to find the menvision company? Whoa! Now someone over at Audiokarma by the name of MeatInStereo is claiming his dad bought the game new for $1 when he was a kid! Here's the thread and here's his two posts on it. He seems legit, with 671 posts there. AHHH!!! I had that game!!! Going to my moms house and looking for it tonight!!!! Well, I registered on Audiokarma and asked him some questions about the game. Did I miss anything? CPUWIZ, a master at making boxes, just posted this image. Hmm. Now, it's implied that he's joking, but it looks damn like the other box, minus the price tag. Edit: Never mind, confirmed as a photochop. So two years later, how does everyone feel? I knew it was fake from the very first time i heard about it for several reasons. I can tell you this: how convenient was is that the box was 'discovered' in the same town as the owner of AA? Amazing condition for something that a non-collector owned, and it was over 25 years old in 2010 (when this pic was taken), although that in itself doesn't prove a hoax. While the box art is the same as the game, it is slightly smaller (it's cropped). If it were the same size it would be more convincing, and if it were larger it would be much harder to fake. I'm still looking into this, and just e-mailed someone who sold one on eBay in November, and claims to have bought one new in 1983. I'll keep you posted.